Before my children were born, I don’t think I quite realised just how much time I was going to spend sitting and feeding them. Whether you choose to breastfeed or bottle feed, you’ll be spending a lot of time on your bottom on the lounge. It can feel like wasted time (even though it isn’t) – but fear not! Plenty of multi-tasking can go on during the hours and hours you’ll be feeding every day. If you can do it with one hand, you can do it while feeding a baby. 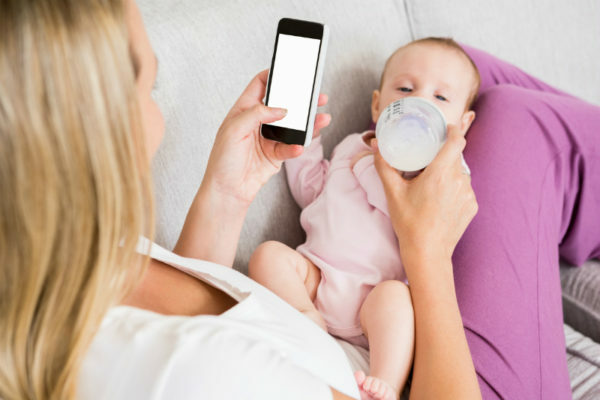 My baby feeding days are behind me, but they’re still recent enough to be jealous of how much I could have achieved with a smart phone in hand. Here’s what I would do if I had my time again. I put this one at the top of the list because you really can’t overestimate the value of any sleep at all that you can get while mothering young children! It won’t be great quality sleep, but the combo of the total exhaustion of early parenthood and the sleepy feeling that sometimes comes with the let-down reflex (if breastfeeding) means that chances are you’ll nod off at least a bit while feeding your baby, no matter how you do it. Embrace the doze! You can knock over large numbers of television shows (by series) in the time that you’ll be spending feeding your baby. Obviously the very early days with your newborn are the best for this, since they’ll take much longer to finish a feed and you’ll be able to manage longer shows and more of them. The flip side is that if you find yourself dozing during an episode (as outlined above) it will be hard to keep track of complicated plot lines. Maybe err on the side of short comedies rather than dark drama for this very reason. What? You want to actually ACHIEVE something? Through the joy of the internet, you can! Just about everywhere offers online shopping these days, so there’s no need to feel trapped in your house. If you’re super organised you can probably even get some kind of app on your phone that supports meal planning, export your shopping list and have the whole lot on your kitchen bench before the next feed. Kicking goals! Look, I’ll be honest. There’s nothing really useful about this. But that game is super addictive. And if you’re feeding your baby at the same time, you don’t need to feel guilty about the number of hours you’re devoting to it. I’m old enough to remember when you had to take a physical bill to the actual post office and stand in line to pay it with cash – but you don’t have to do that. Make a big pile of everything you need to deal with, grab a pen, your phone and your wallet, and the job’s half done already. This one’s just a stab in the dark – I’ve never done any online trading and there is a niggling voice in my head that says perhaps you ought to be careful before gambling large amounts of money at the same time you’re feeding a baby and possibly sleep deprived, but hey – nothing ventured, nothing gained (pun intended!). Let me know how it goes. Charles Dickens. Charlotte Bronte. Thomas Hardy. Maybe you meant to read them all at some point, but life got in the way. But now you have hours (and hours and hours) in which you’re sitting still. What better time to catch up on your reading goals? Or you can leave them on the coffee table, read a trashy magazine instead and just let people assume the best. No judgement. Smart phone to the rescue again! In one little device you have a calendar, a research tool and the means to send text messages or emails. Why not take some time while feeding your baby to plan out what you’re going to do for the rest of the week?